At the end of the day you’re spent, but wonder what you achieved. The path to success is doing what matters most. 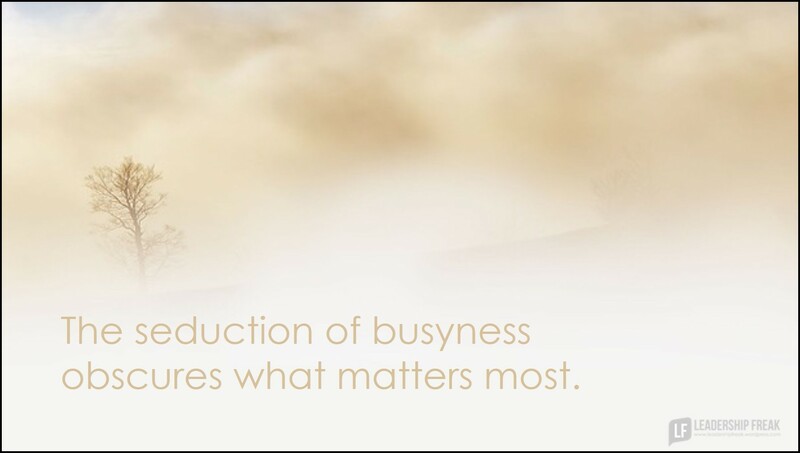 The seduction of busyness obscures what matters most. The persistent pursuit of what matters most is the beginning of doing what matters most. The thing itself is seldom fully clear. Daily pursuit is all there is. The power of seduction is its beauty. #1. Problems and problem solving. The deadliest seduction leaders face is the wrong-headed focus on solving problems, rather than seizing opportunities. Positive aspiration – working toward something – is more powerful than focusing on something you don’t want. Some leaders fear they wouldn’t matter if they weren’t solving problems. In reality, you matter most by pushing toward positive objectives. Solving problems may inflate your ego, but it’s reactive leadership. Ignoring problems is a problem, but spend 80% of your time pursuing pre-defined objectives. The delight in people running to you with urgencies is a weak leader’s way of feeling important. In reality, it’s an indication of failed leadership. Take action on emergencies. Reject the notion that urgencies are priorities. #3. Failure to reflect and rigorously evaluate your use of time. A team member says, “Did you know about … (insert issue)?” What they really mean is, “YOU should do something about that.”Being good hearted, you unwittingly adopt their monkey. You end up living by someone else’s values and priorities. The monkey rule: The person who sees the issue must be involved in solving the issue. Sometimes they have a self-serving agenda anyway. Devote 80% of your energy pursuing objectives you have chosen, not the ones someone else chooses for you. This principle applies to teams as well. Don’t stand aloof from other people’s concerns. Just don’t adopt monkeys. How might leaders identify what matters most. What distracts leaders from what matters most? 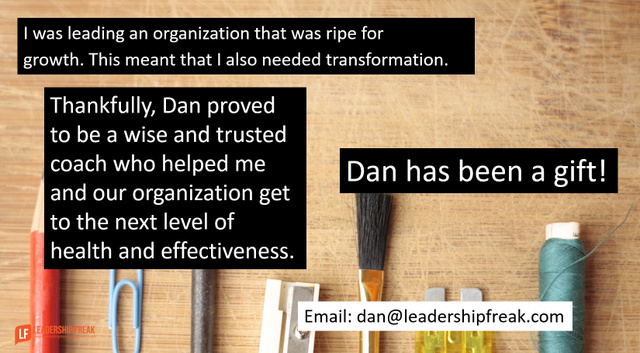 How might leaders identify what matters most? (1) Have a Rule of Life that you regularly revisit with these question in mind: Does my schedule reflect the values I’ve laid out for myself? If not, what needs to change? (2) If you’ve done strategic planning with your team, place your goals somewhere you’ll regularly see them and then ask yourself if where you spending your time (or asking your team to spend their time) is moving you/them towards or away from achieving those goals. Thanks Carmen. Love the questions you suggest. How does my use of time reflect my values? How does our use of time reflect commitment to achieving goals? Glad you enjoyed the monkey stuff. In case some readers don’t know, HBR published an article about who has the monkey many years ago. Brilliant again Dan. Truly a ‘train of thought’ that I was easily able to get on board with. Graham Cooke wrote in his book, “Divine Confrontation” – ‘Repentance is a continual submission to the revelation of the Lordship of Christ.’ If ‘busy is our modern benchmark for being successful, we have then been seduced by our own abilities. A Vision Statement or Rule of Life are great tools. And like the roads in New Jersey, which seem to have a plethora of traffic, it is almost unavoidable the seduction of busy. But thankfully, repentance is always available. Thanks Anthony. I must say that the phrase “seduced by our own abilities” really jumped off the page. What matters most is who your serving! Our clients generate our services, so putting them in the drivers seat is crucial. We need to devote our energy to their project to keep our journey going. If we fail the client we fail ourselves. So positive projects with competitive solutions, by competent workers contribute to our journey. Stay off the monkey bars unless you can swing! Thanks Tim. I really like that you brought the organizational view point to this post. You add the question, How does this best serve our customers? So true, majority of us still need to pay the bills, although the greater satisfaction for me is providing the service, helping others for their journey cooperate or in life. As a child we were taught a song, “With eternity’s values in view, Lord, with eternity’s values in view; May I do each day’s work for Jesus, with eternity’s values in view.” Life is but a breath. When my dad moved to his new home in heaven in January, his next to last words were,”i didn’t think it would come this fast”. A good friend of mine went to work on Tuesday, and fell to his death from a height of 67 meters by 9h15 AM. The brevity of life on earth, the thought of eternity and passing in review before Christ bring into sharp focus the need for purposeful living. We are stewards of the people, goods, talents, time that have been entrusted to us. Laser-like focus is a must. We are to set aside sin and the things that unfocus us, run with patience in our race, and look to the finish line as did Christ. He endured the cross, despising shame, that we might have life and He might have joy because we had life. Easy to say and conceptualize-VERY hard to do. It is a race, requires effort and persistence. This is not about us, but about being a good and faithful servant. Leading is not a position. It is a vocation, whether it be leading a family, a sports team, a classroom, or a multinational corporation. It brings awesome responsibility. We are called to be stewards of what has been given to us. I enjoyed rule number 4, adopting someone else’s monkey is a challenge for someone like me who listens for problems to be solved and solves them. I will add the person who sees the problem must be involved in solving it. This is sometimes a challenge in organizations that do not empower their people.